This intimately scaled lodge is all about romance and grand vistas. Nine thatched guest suites, each with a private deck and plunge pool, perch high above the Great Fish River, where the silence is punctuated by the cry of African fish eagles. Tranquillity and privacy are prized, and suites include touches like candles and soft throws for chilly evenings. This is an intimate boutique lodge based in a 1948 farmhouse, the River Club is just the ticket for privacy-seeking newlyweds. There are a mere 11 colonially inspired, newly refurbished suites on the 50-acre property, which borders the Zambezi River. This all-new camp combines modern comfort with a timeless, classic ambience. Laid out along the Sabaringo River, 40 spacious, secluded tents overlook the fabled Masai Mara plains. An elegantly refurbished camp with 12 gorgeous and comfy tents, this ultraluxurious retreat shares an unfenced boundary with the famous Kruger National Park—which translates to exceptional game-viewing year-round. 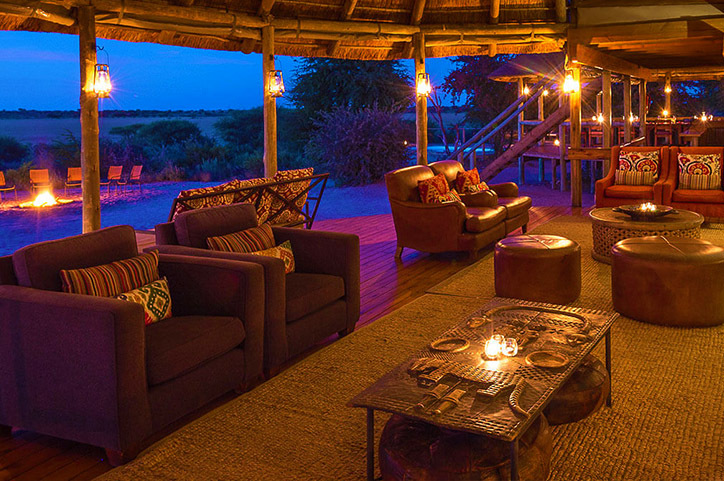 The casual yet comfy 11-tent Camp Kalahari sits on the edge of the remarkable Makgadikgadi Salt Pans National Park, a surreal, lunar-like landscape that is a remnant of a huge ancient lake. The tents’ simple décor—a mix of original African pieces and textiles (Moroccan kilims) with colonial antiques (four-poster beds)—has the ambience of a traditional Victorian-era explorers’ camp.